Our transport minister launches national campaign on drone safety today. Have a look at the link below from Transport Canada which details all the new rules and regulations. It's quite informative, what do you guys think? We'll be sharing our thoughts with CBC Radio 1: Here and Now with Gill Deacon at 5:20pm EST today, stay tuned! Unmanned aircraft (no pilot on board) go by many names—unmanned air vehicle (UAV), remotely piloted aircraft system, model aircraft, remote control aircraft, and drone. Transport Canada expects you to follow these basic Do’s and Don’ts. Always be able to see your aircraft with your own eyes – not only through an on-board camera, monitor or smartphone. Respect the privacy of others – for example, avoid flying your aircraft over private property or using it to take photos or videos without permission. Your aircraft weighs more than 35 kilograms (77 pounds) regardless if you use it for work or pleasure. What is the purpose of a Special Flight Operations Certificate? Special Flight Operations Certificates are required under the Canadian Aviation Regulations so that Transport Canada can verify operators can use their UAV or drone reliably and safely. The Special Flight Operations Certificate contains conditions specific to the proposed use, such as maximum altitudes, clearance from people and property, operating areas, and coordination with air traffic services. How do I apply for a Special Flight Operations Certificate? You must email a detailed application to the nearest Transport Canada regional office. You must provide your contact information and describe how, when and where you plan to use your UAV or drone. You can find more information on what you need to include in your application at https://www.tc.gc.ca/eng/civilaviation/opssvs/managementservices-referencecentre-documents-600-623-001-972.htm. If you have any questions about applying for a Special Flight Operations Certificate, please contact services@tc.gc.ca. How long does it take to get a Special Flight Operations Certificate? It may take longer if we must contact you for more information or have received a large number of applications. How long is a Special Flight Operations Certificate valid? A Special Flight Operations Certificate is valid for a limited period of time. How does Transport Canada enforce the regulations? Transport Canada regulates the use of all aircraft, manned and unmanned, to keep the public and our airspace safe and secure. If the operator is flying for recreational purposes, it’s illegal to fly an aircraft in a way that puts aviation safety at risk. The courts would decide on the penalty. If the operator is flying an aircraft without a Special Flight Operations Certificate, and should be, Transport Canada can issue fines up to $5,000 for an individual and up to $25,000 for a corporation. If an operator does not follow the requirements of their Special Flight Operations Certificate, Transport Canada can issue fines of up to $3,000 for an individual and up to $15,000 for a corporation. Does Transport Canada plan to review the current regulations for unmanned aircraft like UAV, model aircraft or drones? Yes. Transport Canada is working with stakeholders and international partners to review and update safety regulations that will address developments in this growing sector and advancements in technology. Our goal is always to maintain the safety of those on the ground and in the sky. What laws apply to unmanned aircraft? In aviation, you must always think safety first. In addition to respecting the Canadian Aviation Regulations, you must follow the rules in all acts and regulations—including the Criminal Code as well as all municipal, provincial, and territorial laws regarding trespassing and privacy. If you think someone has committed a criminal offense, please contact your local police department. If you are concerned about the safe operation of an aircraft, you can report it to Transport Canada at services@tc.gc.ca. Why are there so many different terms for unmanned aircraft? You probably know them as “drones”, but the aviation community uses many different terms. The words to describe unmanned aircraft are changing almost as quickly as the technology itself. Model aircraft describes those usually used by hobbyists for recreational purposes. Other countries are using the term “remotely piloted aircraft system”, or RPAS. The International Civil Aviation Organization uses this term as a catch-all for all unmanned aircraft. Call your aircraft what you like—but Transport Canada expects you to operate it safely and legally! How many Special Flight Operations Certificates has Transport Canada issued? Transport Canada issues more Special Flight Operations Certificates each year, as UAVs and drones grow in popularity. Between 2010 and 2013, we issued 1,527 approvals for UAV operations..
What's keeping America's private drone industry grounded? Read the fine print, everyone is coming up to Canada. For once we're way ahead of the game. Now they just need to let us come down south of the border! In this 3-day workshop, we present an introduction to UAVs and review the rules and regulatory concerns of this new technology. Students are provided with an in-studio flight simulation and gain valuable practical experience during our full-day demonstrations with the 4K cinema camera and Flyingfish Octocopter! Day 1 (Oct 15th, 2014): Introduction to UAVs. Taught by industry pro Flyingfish Productions at the Humber School of Media Studies - The Part Time School. At one time it was a grand demonstration of industrial power, Canada’s first 100-megawatt steam turbo-generator, coal fired power plant. Officially opened in 1951, over the years it was shifted to burn natural gas and eventually shut down in the early 1980’s, as nuclear power stations were phased in. Since then, this monolithic structure has been left to age and deteriorate, making it an ideal location for filming. Grand halls, industrial turbines, rusted platforms, hanging wires, and odd sounds emanate from dark places. The building has been transformed for films such as Robocop, Resident Evil and the SAW series. With the graciousness of a close friend, we were allowed access to attempt flight and the filming of a demo inside. Here’s what we found! A special thanks to the folks at the Hearn for allowing us to shoot for the week. Many thanks to DJ Woods Productions Inc. for providing our team with the Sony F-55 4K cinema camera. Here's one for scale. This smokestack at the Hearn Generating Station in Toronto is 705 ft (215m) tall. We're flying at roughly 300 feet, capturing some great atmospheric aerial cinematography on the Sony F-55 4K! © 2014 Grant Stirton. All Rights Reserved. Shooting at sunset in Toronto at the Hearn. A great viewpoint of the city! Big day out with 14 successful aerial flights! On the set of Rookie Blue, the Canadian police drama TV series. Aired on Global Television Network in Canada and ABC in the USA. Look out for our aerial shots on the show's season 6 finale. No spoilers here! "I often think the night is more alive and more richly coloured than the day." We had a special opportunity to run several successful flights both indoors and outdoors at the abandoned, decommissioned Richard L. Hearn Generating Station in Toronto. A special thanks to the team at the Hearn for allowing us to shoot for the week. Many thanks to DJ Woods Productions Inc. for providing our team with the Sony F-55 4K cinema camera and to the Russian Arm team at Filmotechnic Canada Ltd. operating the ML55 Chase Car and the Russian Arm System. We've been blessed with great weather for safe flight. It's a wrap for now for Flyingfish Productions! Look up and fly safe. Flyingfish in action! Week one on location at the Richard L. Hearn Thermal Generating Station. Shooting on the Sony F-55 4K. Special thanks to DJ Woods for supplying the camera. NASA's Solar Dynamics Observatory spacecraft captures Wednesday's solar flare eruption. Per Google, it's a brief eruption of intense high-energy radiation from the sun's surface, associated with sunspots and causing electromagnetic disturbances on the earth, as with radio frequency communications and power line transmissions. On Wednesday afternoon, a 'strong' solar flare launched off the sun that could cause some fluctuations in Earth's power grid and slight disturbances in satellites and radio transmissions late today and tomorrow morning. No major disruptions are expected, even though the flare was classified as an "X-class" flare, which is at the high end of the solar flare scale. As explained by NASA, solar flares are powerful bursts of radiation. Harmful radiation from a flare can't pass through Earth's atmosphere to physically affect humans on the ground. However, when intense enough, they can disturb the atmosphere in the layer where GPS and communications signals travel. With possible disturbances in radio transmissions and satellite communication, flight control would become quiet a challenge on the ground. On the plus side, this blast could create a strong display of northern lights Friday night across Northern US, from New England through the Great Lakes to Washington and Oregon. Unmanned aerial vehicles or UAVs are now a real option for photographers and filmmakers who want to get that extraordinary shot or sequence from high up in the air. 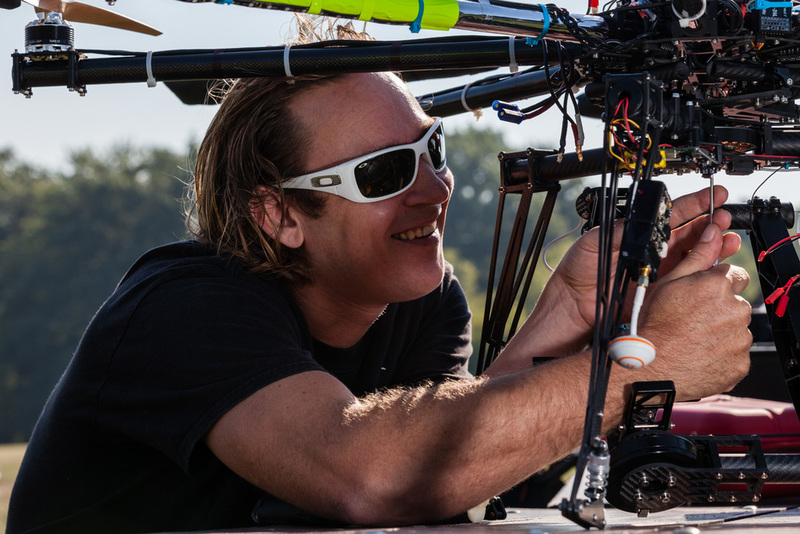 In this training workshop, we introduce you to the world of remote control piloting, camera operating, and the rules and regulations surrounding this exciting new option for digital capture. Using two different sized drones*, participants will test, calibrate, shoot and fly their way into the exciting world of aerial photography. * Each participant gets their own Hubson Quadcopter as part of the workshop fee. To register for this class, please click here or contact us directly at info@flyingfishproductions.com. Flying the RED. A successful flight test at the MMFC Flight park! MMFC Flight Park. Mississauga, Ontario. As with emerging and very promising technologies, the media often get carried away. It's unlikely that pizza will be arriving on your doorstep anytime soon. Besides allowing us to capture images in ways that were previously impossible, the number of lives that could be saved in areas hit by natural disasters or where it is too dangerous to send in relief workers is a very positive step forward. Testing the Gimbal Wheels with the Canon 5D Mark III setup. It's a nice standalone wheel system designed for precision control with great balance and stability. A beautiful day for flight out in the field. Testing the new gimbal settings and aerial footage. It's looking good! Haunted by a mission gone wrong, U.S. drone sensor operator Calvin Williams begins to feel suspicious about drone warfare and the implications it could have on freedom domestically. When his suspicions turn into reality, he is forced to act. 2nd place $10,000 winner of Inforwar's Operation Paul Revere film contest. Coming in for landing at MMFC flight park.